What kinds of things do you use Facebook and Instagram for? On Facebook, I tend to interact mainly with friends and acquaintances, with a little bit of family in the mix. In terms of what I post, it’s usually jokes, political satire and a little outrage as well. My networks have similar values, so it’s a good space to build support or share ideas. On Instagram I engage with a similar group but I also comment on images posted by people I admire – though rather than starting a conversation with the individual, I’m usually tagging my actual friends in comments along the lines of ‘hey, isn’t this cool!’ Dorky things like that. In terms of what I post, it’s usually pretty things (so clichéd! ), pictures of my dog, Scout (my usual internet name is “allyoscout”, as it reflects the majority of my content) or strange things I see and I think others need to see. Public. It used to be private but I decided I didn’t care. I also started my own business and thought maybe it would be a good idea to be public. Scout is part of your business’ online brand – perhaps your personal brand as well. Do you see it that way? Definitely. She’s part of my family, and I take her to work with me all the time. I’m sort of known/remembered because of people’s relationship with her. People I haven’t seen for years ask me how she is. She’s also a very friendly hound and that’s an important part of our brand as well. Be kind, be welcoming. When you say ‘our’ brand – are you talking about Lady Scout Studio? Me and the business. Although, the biz is a bit more polished than I am! I suppose I have realised as I get older that it’s really important to be kind and friendly. I like the idea that you have a brand philosophy, for yourself I mean. Now that I’m writing it out, I kind of feel like a dickhead! I suppose I have realised as I get older that it’s really important to be kind and friendly. My MySpace page from my teen years certainly wasn’t like that! Wow – MySpace! A blast from the past. Yeah! I couldn’t log onto it for years and it had all this terribly embarrassing stuff on it…god! But even though it was angsty, it still had the silliness/friendliness I have now (I think..). Do you ever feel like you need to be different online from who you are offline, or vice versa? I don’t think so. I feel like I censor myself more than I think some other users do, though. Like, if I was down in the dumps I probably wouldn’t post it on Facebook. But if I felt like dancing to Tina Turner’s ‘What’s Love Got To Do With It’, well, that I probably would share. I suppose I just try to post positive things where possible. Life’s hard enough. I also don’t really do the selfie thing. Other people seem to like it but I find it really uncomfortable. Selfies do seem to really divide opinion. They are, and I suppose that’s another reason for my dislike. I don’t really find it empowering, it makes the individual really vulnerable. Amongst young teens especially, they’re often putting these images out there, silently asking, ‘what do you think? Am I acceptable? Am I hot?’ It starts this dialogue amongst girls which is really unhealthy. That said, a lot of teens are also rejecting social media. Do you ever feel those pressures yourself? Of course! I don’t want to be vulnerable like that. And I also feel like doing it won’t make me feel ‘acceptable’. That has to come from me. People are so casually rude or so glaringly misinformed and so ready to get into a barny with a total stranger. Do you see online spaces as generally positive, negative or neutral places? It’s a combination. I think if you cultivate networks of like-minded people, you can have a really positive experience. But if you stay friends with your racist, misogynistic mate from kindergarten, it’s probably gonna grate on you. A friend of mine this year made a resolution to not read comments on public pages (like on the Guardian, VICE or ABC articles, etc) because that’s where the negativity lives. Lately, I’ve been thinking that perhaps I need to take a leaf out of her book, because I do read the comments and they do drag me down. I rarely comment myself but I often feel on the verge of getting involved. People are so casually rude or so glaringly misinformed and so ready to get into a barny with a total stranger. I so want to defend things like feminist issues but I also don’t want to invite that drama into my world. Is it important to you that people know your political or social values? Yeah. It’s a huge part of my identity, and it’s usually part of the reason I’m connected with people online. Sharing an image like that doesn’t accurately convey my response or the complexity of the situation and could easily be misinterpreted. Online platforms like social media can give us a bigger, or perhaps more widely-heard voice. Do you think this changes how you discuss your values? I’m far more measured than I would be over a couple of drinks but the essence is the same. I’m lucky in the sense that I’m not ultra left or right (I consider myself a reasonable, inclusive feminist) so I rarely feel as though I’m sharing things that are controversial or risky. Although I did share something about Charlie Hebdo that still worries me, but usually it’s fine. I get more worried about my grammar and spelling! Did you second guess yourself for sharing it? 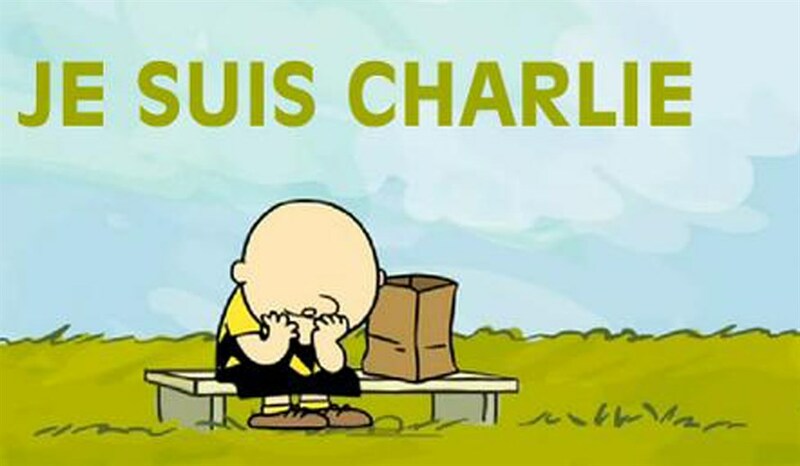 They [Charlie Hebdo] were total twerps and completely disrespectful but that doesn’t mean they deserved that. I suppose sharing an image like that doesn’t accurately convey my response or the complexity of the situation and could easily be misinterpreted. I love these two images you’ve submitted. Can you tell me a bit about the first one, Dream Lodge Motel? Thanks! Dream lodge is my happy place. I imagine swanning around that pool, glass in hand, listening to the ‘Girl From Ipanema’ as the sun sets. I love the idealism of kitsch, the aesthetic of leisure. It also depicts a very interesting era. Yeah, not very feminist! But it was so stylish. Sigh. I just really like the stoned expression on Scout’s face in that one! I’m all silly and pouty, whereas Scout’s like, ‘meh’.  Archived in Personal Branding, Professional Identity, Selfies, Social Media and tagged Facebook, Instagram, MySpace, the Comments Section. Bookmark the permalink.